This 11.8 oz, 5.5 mm heel to toe drop road specific ( smoother mud free trails fine too) is a wonderfully comfortable ride. It fits true to size for me. The outsole is narrower in forefoot than the Bondi with a landing pad at the first metatarsal. I used to get cramping in forefoot at the first metatarsal, especially road running, due to the width. The shoe is somewhat more flexible in the forefoot than any previous Hoka. Hokas by their nature are not flexible relying on the geometry of the midsole to roll you along. Trust me it really works. The upper is outstanding, made of a densely woven mesh. The issue of tying in the toe area and making it flexible enough is solved by reducing the seams to one over the middle of the toes. Instead of using vertical supporting overlays as most shoes do the Tarmac uses horizontal overlays, the white lines in the pictures above. These horizontal overlays help forefoot flex. Given that the foot is embedded 20-30 mm down into the midsole foam using Hoka's patented "bucket seat", the shoe is plenty stable. The outsole doesn't have any lugs and is smooth on the road. Much smoother lay down than the Bondi. Nice decoupled heel. With the exception of mud or snow the Tarmac is fine on moderate trails. All the blue areas as well as the top and bottom of the mid foot outsole are long wearing outsole. The only softer EVA midsole material is the triangle just behind the heel. The quick pull lace system is effective. Dial in fit and forget about it. So why in an age where "minimal" running is all the rage ( or passing rage in my view) wear Hokas, the most extreme of oversized, cushioned shoes? I like to say they feel very natural, like running on grass...on the road or the rocky trail. On the trail, no rock punch through and total confidence on the downhills due to the wide stance. Despite their super cushion they are not mushy and unresponsive. 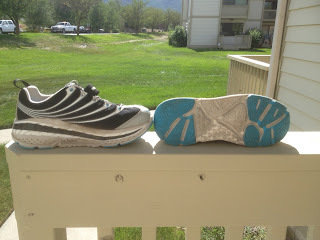 The rolling gait required by the stiffer outsole, once easily mastered, is very natural and smooth. This could be a wonderful shoe for runners and walkers with chronic hip or knee pain due to the shock attenuation and stability. A great shoe to do big or recovery miles in as no matter the distance the next day my legs are considerably fresher than in other shoes. For me the shoe for slower and longer miles. Next up speedy Hokas. 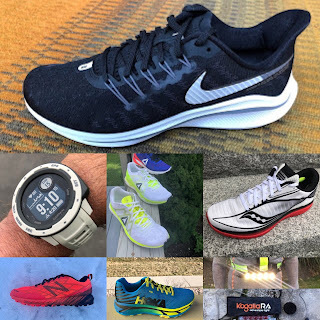 Ian Corless blog reports a 2013 model the Rapa Nui Comp trail runner which will come in at around 9.7 oz as well as the Kailua Comp road runner, likely a bit lighter. 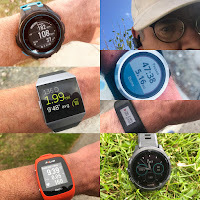 While maintaining Hokas oversized approach, tuning it down a bit as in my 2012 favorite trail runner the Tecnica X-Lite, these new models will likely be shoes that bridge the gap between oversized comfort and protection, and speed. Can't wait. If you want a pro's thoughts on Hokas check out Karl Meltzer's video here. Karl is an old pro winner of dozens of 100 mile ultras including 4 this year alone.